A stuffed crepes that everyone will adore. This dish is simple, has excellent presentation and is so delicious! Ingredients: Crepes: 250g flour, 4 eggs, 25g melted butter, 500ml milk. Stuffing: 350g ground beef, 1 onion, 2 tbsp tomato sauce, 200g grated mozzarella cheese, 5 yolks, parsley. In a medium bowl, mix flour, 4 eggs and melted butter and gradually pour the milk until you get a smooth crepes dough. In a pan over medium heat, cook ground beef with chopped onion, add tomato sauce and cook for a few minutes. Add cooked beef mixture on each crepe and wrap them. Add 5 crepes in a casserole. 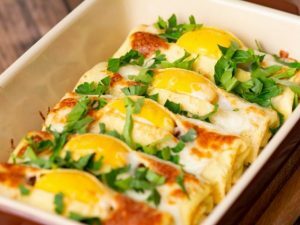 Using a knife, make a cut along the length of each crepe roll and add yolks. Sprinkle with mozzarella and bake for 15 minutes at 180°C/350°F.